In the 70th year of the NHS, a lot of discussion has taken place about the future of the health service. With NHS staff under significant strain, we urgently need to harness the untapped potential of volunteers. Well-managed volunteers can help healthcare professionals to meet the diverse needs of patients, especially older patients or those with less family support. HelpForce is a not-for-profit organisation that was established last year to alleviate pressure in the health service. It aims to ensure that volunteering is recognised and supported by leadership teams in hospitals. Working with hospital trusts, HelpForce enables volunteers to support NHS staff by helping with the small but significant moments that make a big difference to patients. I am currently on sabbatical from my position as head of volunteering at Kingston Hospital NHS Foundation Trust in Surrey, where more than 50 volunteers spend time with people at all stages of dementia, helping them take part in hobbies such as music, gardening and local history. One older patient had been unresponsive for three weeks, but, with support from a dementia volunteer, he was able to begin enjoying his meals, and even started tapping his foot to the 1940s music playing as part of a ‘memory lane’ lunch club. His wife told us that, when she witnessed this change, she felt she had been given her husband back in a way she had never again thought possible. This illustrates the wonderful connections that volunteers and patients can make. Mealtimes are a simple but important way in which volunteer support can help improve nutrition and hydration. The trust has more than 100 dining companions, and our research shows that their support can improve patients’ satisfaction at mealtimes, helping to enhance patients’ recovery and minimise their time in hospital. Volunteers can become a vital source of intelligence regarding the needs of patients. For example, dining companions reported that some patients were struggling to open whole oranges, resulting in unnecessary waste that was neither cost-effective nor supported patient nutrition. Switching to easy-peel satsumas enabled patients to eat independently, improving their nutrition and reducing food waste. Volunteer teams can also help improve patient discharge to help prevent older people remaining in hospital longer than necessary, ensuring they leave with the correct prescriptions and support, including continued engagement with healthcare services. 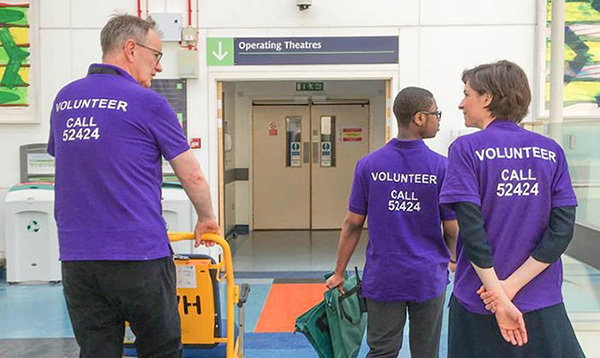 Through the hospital-to-home service piloted at Kingston Hospital, volunteers work with community services and the voluntary sector to reduce the likelihood of readmissions. Telephone support is offered for up to six weeks after discharge. Results of an early pilot showed a 40% improvement in the likelihood of patients staying in contact with a recommended voluntary sector service, with the encouragement of volunteers. Despite its many benefits, there is wide variation in the scale and effectiveness of volunteering across healthcare, which is something that HelpForce aims to address. It has brought together a learning network of 14 NHS trusts, which is working to ensure that high-quality volunteering in healthcare becomes the norm. Kingston, which has around 500 volunteers, is part of this network. It is sharing successful initiatives and knowledge to enable the development of a volunteering best practice model. HelpForce wants to see an improvement in the range and quality of volunteer roles available to support patient care in hospitals and at home. The learning network will contribute to this by measuring and improving the impact that well-managed staff and volunteer teams can have on healthcare. Together, we can use the power of volunteering to improve the health and well-being of people in the UK, bringing benefits for patients, communities, staff, volunteers and healthcare providers.